If you’re going to bake your own bread, you could do worse than start with this one – it doesn’t require kneading, it only needs a very short, single rise, and you can have a batch of three loaves cooling on a rack in an hour and a half! The recipe has been around for almost 70 years – read on to find out more about it and its creator! Tireless campaigner for healthy eating and the promotion of unadulterated foods, Doris Grant was a champion of fresh, natural ingredients and the minimal processing of food, and she maintained a running battle with major food companies in the UK for more than 60 years. Almost crippled with arthritis in her youth, Doris found relief from her symptoms by following the food-combining diet of Dr. William Hay. With her health restored, Dr. Hay encouraged Doris to write her own book for the UK market, and thus began her publishing career. Alongside her many best-selling books, she is immortalised as the creator of The Grant Loaf. Originally, The Grant Loaf was a mistake. While teaching herself to bake in the 1930s, it was several months before Doris realised she had not been kneading her bread dough. It didn’t seem to have made much of a difference to the loaves, and was a great deal easier and quicker than the traditional method, so she included her ‘mistake’ in her 1944 book Your Daily Bread. Here, with only a few adjustments, is that original recipe. The dough ends up a lot wetter than traditional dough – so wet in fact, that kneading would be impossible if it weren’t already unnecessary. 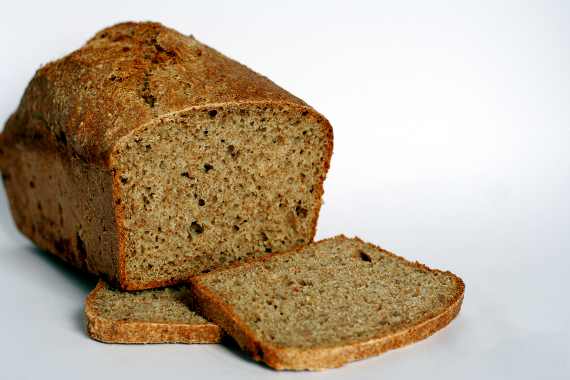 The bread itself is firm without being brick-like, and has a wonderfully nutty flavour as well as making great toast. I bake it in our house as our everyday bread, including sandwiches and packed lunches. 1. It uses a whole bag of flour at once – no messy half-bags to clutter up your cupboards and spill over everything. 2. It makes sense, as well as efficient use of the oven, to cook more than one loaf at a time and the additional loaves can easily be frozen for use later. Put the flour into a large bowl and place in a gentle oven to warm. It doesn’t much matter if you don’t warm it, but it does speed up the rising. Put the sugar and salt into a large jug and add half the water. Stir to dissolve. Grease the bread tins using cooking spray or oil. Mix the yeast into the warmed flour and pour in the sugar/salt mixture, then add the rest of the water. Stir until the flour is fully mixed in. This is probably easiest to do using your hands, but using a utensil works well, also. Personally, I use a large two-pronged wooden fork from an otherwise unused set of salad servers, because the prongs move easily through the wet mix. I regularly manage to whip up a batch of this bread without touching the mix with my hands at all! Remember: you’re only mixing, not kneading – so as soon as all the flour is incorporated, stop. The dough will be much more moist than traditional bread dough – more like a fruit cake mix or thick, badly-made porridge. Spoon the dough into the bread tins, making sure it’s evenly divided – each tin should be approximately ¾ full. If you want to measure by weight, it’s approximately 950g per tin. Set the tins on a baking sheet somewhere warm to rise by about 1/3, until the dough is just above the top of the tins and nicely rounded. It should take no more than 30 minutes. If, like me, you’re lucky enough to have a double oven, then put the baking sheet onto the shelf in the top oven while the main oven heats up. NB Don’t put the tins onto the floor of the top oven – even if they’re on a baking sheet – it will get too hot. Otherwise, anywhere warm and draft-free will do. Preheat the oven to 200C, 180C Fan. Bake for 30 minutes, then turn the baking sheet 180° and bake for a further 20 minutes for a total of 50 minutes. Remove the tins from the oven and tip out the bread. Arrange the loaves on a wire rack. Put the loaves back into the oven for 5 minutes to crisp up the crust. Cool on the wire rack. Variations: This method can also be used with brown bread flour, for a slightly lighter loaf. Third try of this has been the best so far, but it’s still only around half the height that it seems it should be (going by reference sandwiches in the office). I put it in the oven after 35 mins of rising in the warm top oven, but to be honest it hadn’t risen much. Fresh yeast, fresh flour… but I am doing this in 1-loaf batches as I only have one loaf tin! Could that be making a difference? If you don’t want to buy 2 more loaf tins, then the first thing I’d suggest is checking the quantities of the scaled-down ingredients: 500g flour, 5g yeast, 435ml water 8g salt, 8g sugar. 1. Water temperature – too hot and it can kill the yeast – body temperature is best. 2. Make sure the salt and sugar are fully dissolved before adding to the flour and yeast. 3. In the warming oven – check it’s not getting too hot – it can kill the yeast. 4. Also, too long and the dough will start to deflate – it should be slightly rounded above the sides of the tin when it goes in the oven to cook. 5. Finally, make sure the tin isn’t on the bottom of the top oven when rising – it will get too hot from the main oven heating up. Stand it on the shelf. Hi Maryann, can you confirm the weight of your instant yeast packets. We get packs of different sizes where I live. I made 3 loaves today. Two are in the freezer and one is in the bread bin. Really easy and absolutely delicious! And Huzzah! So glad you like the bread – it is almost ridiculously easy and delicious, no? Tried this recipe bread tastes good but the top and all round is too crusty,baked 180f 50 mins what s wrong ? Am a bit puzzled by your question – it sounds like you have baked a perfect Grant loaf. If you don’t like the crispness of a loaf fresh from the oven, let it cool for 24 hours before cutting into it. The outside will soften to a chewy, rather than crusty texture. P.S. Did you really mean 180F as the baking temperature? I made this bread today and it turned out perfect, I could have eaten it all in one go. This will be our bread for the future.